This Canadian band needs no introduction. The band of Robb Reiner and Steve Kudlow (Lips) never got the big success they deserved. With the documentary 'The Story of Anvil' they fortunately earned a lot more credit. If band members of Metallica, Slayer, Anthrax and lots more say that the band Anvil influenced them for a big part, the band can be proud of that legacy. Besides these 2 albums, they also re- released their 1996 and 1997 albums 'Plugged in Permanent' and 'Absolutely No Alternative'. 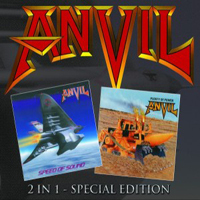 'Speed of Sound (1999) and 'Plenty of Power' (2001) are both albums that show what Anvil stands for. The typical drumming style and Lips recognizable guitar sound packed together in fast tracks and sometimes funny lyrics. Songs like "Speed of Sound", "Park That Truck", "Plenty of Power", "Real Metal" and "Beat the Law" are still tracks the fans want to hear from them on stage. If you are a fan and don't own these albums already, this is the right moment to purchase them. Fans of fast metal that want to know who invented speed metal and inspired tons of metal bands can grab this opportunity to buy them and honor the ones that deserve it.